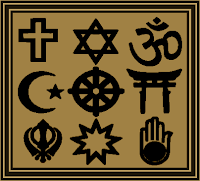 The Brookings Interfaith Council (BIC) will meet at 6:30 pm on Thursday, September 10th, at St. Paul’s Episcopal Church (726 Sixth Street / Corner of 6th Street and 8th Ave) in the Thorburn Fellowship Hall (Lower Level). Our customary potluck will be followed by some brief presentations and discussion on science and faith. Evolution versus Creation! Medical Science versus Faith! Many of you might be familiar with various positions Christians hold regarding such topics. Have you ever wondered if Muslims, Hindus, Buddhists, or Bahá'ís hold similar positions? If so, please join us for good food and great discussion!